 Dr. Baldwin and her staff always answer all of my questions and I never feel like my appointments are rushed in any way. This is my second procedure so it’s obvious that I think you are an excellent Dr. & Staff. 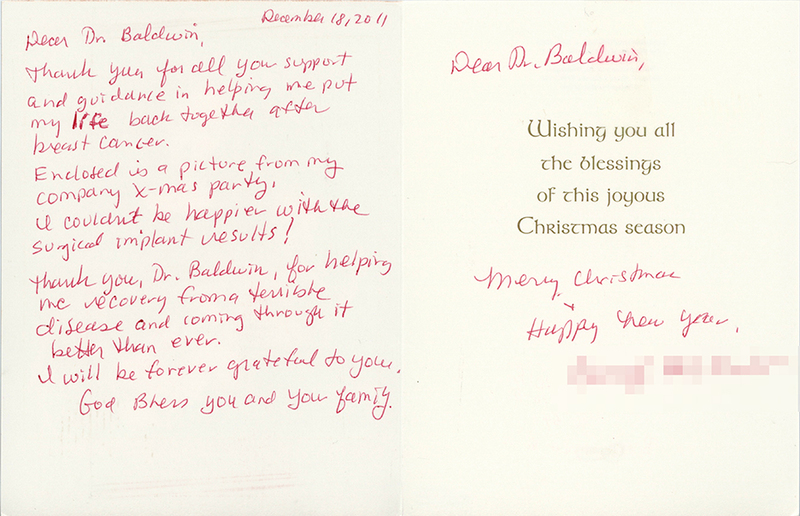 Dr. Baldwin is an excellent doctor who gave me confidence from the start! All the details to my surgery were explained in detail. Definitely one of the best decisions of my life! Thanks to all the great staff! Thank you for all your support and guidance in helping me put my life back together after breast cancer. Enclosed is a picture from my company x-mas party, I couldn’t be happier with the surgical implant results! Thank you, Dr. Baldwin, for helping my recovery from a terrible disease and coming through it better than ever. I will be forever grateful to you. I just wanted to thank you for making such a difficult experience easier. 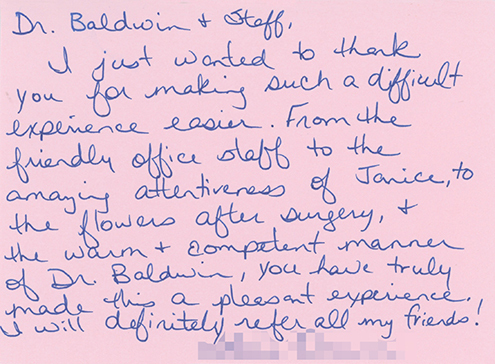 From the friendly office staff to the amazing attentiveness of Janice, to the flowers after the surgery, & the warm and competent manner of Dr. Baldwin, you have truly made this a pleasant experience. I will definitely refer all of my friends! I could not be happier with the outcome of my procedure and the professionalism of the Dr. and staff. I will refer her every chance I get.